This year the society’s centre piece was again a beautifully decorated Christmas Tree. The buffet not only held a Christmas Cake and many other “goodies” but a large plateful of traditional “mince pies” this year. On the tables was a Christmas Cracker for everybody. As they contain an “explosive” it is no longer so easy to transport Christmas Crackers, by plane, from Britain any more. Hazel only returned from Britain by car after the middle of October. In the car were 2 large boxes of Christmas Crackers for the society. 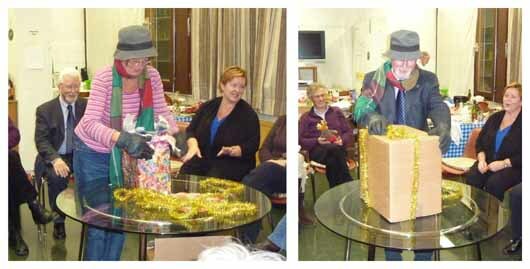 Before we “pulled” our crackers, Hazel told us the history behind the now traditional Christmas Cracker. 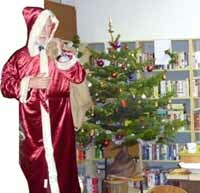 Before Father Christmas arrived to give everybody a little present, we heard a selection of seasonal readings, which brought back the true meaning of Christmas to us all. Naturally reading part of “A Christmas Carol” was not forgotten. Later we were all enjoying ourselves so much that something was almost forgotten---the Christmas Pudding had, by then been steaming for a long time. Despite a long steaming the pudding was delicious.